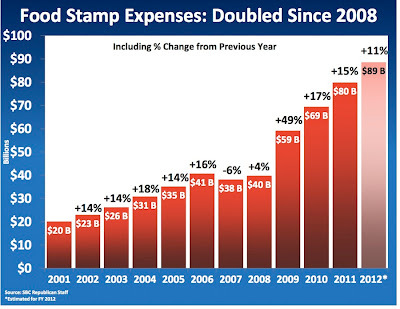 Left Coast Rebel: Why Are Food Stamps a Growth Industry? Linked: http://bit.ly/YRXbyd with a comment of my own. It's just another facet of the Cloward-Piven strategy that the Dems are pursuing. Overload the system with so many moochers and so much debt that it all collapses. Re make the country out of the ashes. Seems to be working all too well so far. ...but once on the system, they vote to perpetuate entitlement. The entire idea is so foul that to some it is embarrassing and to others it is a way to shirk responsibility. Is this what our country is using as a lure for illegal immigrants? You bet it is - Made in USA. It has an enticing sound. And, when looking at the family structure of the Boston Marathon Bombers, you can augment it by shop-lifting, and then skipping back "home." This has got to be heaven on earth. This post is missing a huge variable: JP Morgan Chase runs the Food Stamp program, as in they have the contract for managing it. It's not about liberals vs. America, it's about a crony capitalist fascist corporation using the police power of the state to ensure the transfer of taxpayer wealth to them and the added perk of creating a serf class. JP Morgan is the company that set up the freaking Soviet Union. They know what they're doing when it comes to mass enslavement - they use candy come-ons to lure people into the trap and then after they've offshored all our jobs and cut off those entitlements, the police state will be ready to roll in and purge our behinds.